so that you will serve only God [Alone]: "I am a warner, a herald from Him to you;"
and so you will seek forgiveness from your Lord; then turn towards Him [in repentance]. He will let you enjoy a handsome allotment for a specific period, and grant His bounty to everyone possessing bounty. If you should turn away, then I fear the torment of a great day for you. Unto God is your return; He is Capable of everything! Indeed they wrap their breasts up to try to hide things from Him. Whenever they attempt to cover themselves up with their clothing, does He not know whatever they conceal and what they disclose? He is Aware of whatever [their] breasts contain. No animal exists on earth unless God provides for it. He knows its lair and its burrow; everything is [to be found] in a clear Book. He is the One Who created Heaven and Earth in six days. His Throne rises over the water, so He may test which of you is finest in action. If you should say: "You will (all) be raised up after death," those who disbelieve would say: "This is just sheer magic!" If We postponed torment for them till a period to be counted out, they would say: "What is delaying it?" On the day when it comes to them, there will be no means them to dodge it, while whatever they had been sneering at will sweep around them. If We ever let man taste any mercy from Us, then snatched it away from him, he would become despondent, ungrateful. except for the ones who act patiently and perform honorable deeds; those will have forgiveness a big wage. Perhaps you are abandoning something that has been inspired in you, and your breast is feeling cramped because of it, since they say: "Why has not a treasure been sent down to him, or some angel come along with him,: You are only a warner, while God is a Trustee for everything. Or do they say: "He has made it all up!" SAY: ´Well then bring chapters made up like it! Appeal to anyone you can manage to instead of to God if you are so truthful. If they do not respond to you, then know it has only been sent down with God´s knowledge. There is no deity except Him. Will you not become Muslims?" We shall repay anyone who has been wanting worldly life and its attraction according to their actions in it; they will not be caught short there. Yet those will have only the Fire during the Hereafter anything they have been producing in it will collapse and whatever they have been doing will [prove to] be useless. 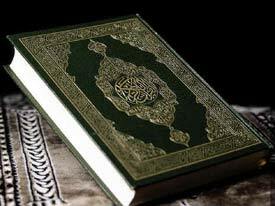 What about someone who has [received] an explanation from his Lord and to whom a witness from Him is reciting while Moses´ book lies before him as a token and a mercy? Such persons believe in it. Anyone from the factions who disbelieve in it will have the Fire for his appointment, so do not be in any quandary about it; it is the Truth from your Lord, even though most men do not believe so. those who obstruct God´s way and attempt to make it crooked, and are disbelievers in the Hereafter? Those will not prevent anything from happening on earth nor will they have any patrons besides God. Torment will be doubled for them. They have not been unable to hear nor have they been observing [anything]. Such are the ones who have lost their own souls, while whatever they were inventing has led them astray. It is positive they will lose most in the Hereafter! Those who believe, perform honorable deeds, and yield unto their Lord, will become inhabitants of the Garden; they will live in it forever. Both groups can be compared to a blind and dumb man, alongside a sighted and hearing one. Are they alike for the purpose of comparison? Will you not bear this in mind? so that you may worship nobody except God [Alone]. I fear the torment of a painful day for you!" The notables from among his own people who disbelieved said: "We regard you only as a human being like ourselves. We do not see that anyone follows you except those who are the meanest among us, who are just beginning to form opinions. We do not consider that you (all) have any advantage over us; rather we think you are lying. He said: "My people, have you considered whether I have [brought] any explanation from my Lord? He has sent me mercy from His presence, although it has been disguised so far as you are concerned. Shall we compel you to [accept] it while you dislike it? And my folk, I do not ask you for any money for it; my wages come only from God. Nor am I driving away those who believe: they will be meeting their Lord [anyhow]. Yet I do see you are a folk who act out of ignorance. My people, who will support me against God if I should drive them off? Will you not bear this in mind? "I do not tell you that I hold God´s treasures, nor do I know the Unseen nor say I am an angel, nor do I tell those whom you eye with contempt that God will not give them anything good. God is quite Aware of what lies in their souls. I should then be a wrongdoer." They said: "Noah, you have pleaded with us, and kept on pleading with us. Bring us whatever you threaten us with if you are so truthful!" He said: "Only God will bring you it, if He so wishes. You will not prevent it. My advice will not benefit you no matter how sincerely I want to advise you, should God be wanting to let you wander off. He is your Lord and to Him will you (all) return." Or do they say: ´He has invented it!"? SAY: "If I have invented it, then my crime rests on myself; while I am innocent of any crimes you may be committing." It was revealed to Noah that: "None of your folk will ever believe except for someone who has already believed. Do not despair about what they have been doing. Build the Ark under Our eyes and Our inspiration. Do not preach to me about those who have done wrong; they will be drowned." As he was building the Ark, each time any gentlemen from his own people passed by him, they would sneer at him. He said: "If you ridicule us, then we´ll ridicule you just the way you are sneering. You will come to know who will be given torment which will shame him, and have lasting torment settle down upon him." So when Our command came and the bowels (of the earth) welled up, We said: ´Load her up with two apiece from every species, and your own family - except for anyone against whom the Sentence has already been pronounced-as well as anyone who believes." Yet only a few believed along with him. He said: "Board her: "in the name of God is her sailing and her mooring; my Lord is so Forgiving, Merciful!" She sailed on with them through waves that were like mountains. Noah called out to, his son who stood aloof by himself: "My dear son, sail away with us, and do not stay with the disbelievers." He said: "I´ll take refuge on a mountain which will protect me from the water." He said: "Nothing is safe today from God´s command except for someone who has been shown mercy." A wave swept in between them so he was one of those who were drowned. It was (also) said: "Away with such wrongdoing folk!" Noah called upon his Lord and said: ´My Lord, my son belonged to my own family, while Your promise is true, and You are the wisest Judge!" He said: "Noah, he no longer belongs to your family: his behavior was dishonorable. Do not ask Me about something you have no knowledge about; I so caution you lest you become ignorant." He said: "My Lord, I take refuge with You from asking You something I have no knowledge about. If You do not forgive me and show me mercy, I may become a loser." It was said: "Noah, land in peace from Us; blessings will [rest] on you and on some of the nations who [will spring] from you. We shall let some [other] communities enjoy themselves; then painful torment from Us will afflict them." This is some of the news about the Unseen which We reveal to you. Neither you nor your people knew them before this, so be patient. The outcome belongs to those who do their duty. To Ad [we sent] their brother Hud. He said: "My people, worship God [Alone]! You have no other deity except Him. Otherwise you are only making things up. My folk, I ask you for no payment for it: my wage comes only from the One Who fashioned me. Will you not reason [things out]? My folk, seek forgiveness from your Lord, then turn to Him [repentant]. He will send the heavens down upon you in torrents and add strength to you even beyond your own strength. Do not turn away like criminals. instead of Him. Plot away all together against me; then do not keep me waiting! I have relied on God, [Who is both] my Lord and your Lord. There is no animal which He does not grasp by its forelock. My Lord is on a Straight Road. Even if you should turn away, I have still delivered to you what I have been sent to you with. My Lord will replace you with some other people than yourselves, while you will not harm Him in any way. My Lord acts as a Keeper over everything. Once Our command came, We rescued Hud as well as those who believed along with him through mercy from Ourself-, We saved them from stern torment. Such [people] were Ad: they repudiated their Lord´s signs, defied their messengers, and followed the command of every stubborn oppressor. They were followed by a curse in this world as well as on Resurrection Day. Did not Ad disown their Lord? Well, it meant: "Away with Ad, Hud´s folk!" To Thamud [We sent] their brother Salih. He said: "My people worship God; you have no deity besides Him. He has produced you from the earth and let you settle down on it, so seek forgiveness from Him. Then turn to Him; my Lord is Near, Responsive." They said: "Salih, you have been a source of expectation among us until now. Do you prohibit us from serving what our fathers worshipped? We feel suspicious doubt about what you are appealing for us to do,"
He said: "My folk, have you considered whether I bring any explanation from my Lord? He has given me mercy from Himself. Who will support me against God if I were to disobey Him? You would only ma me lose even more. "My people, this she-camel belonging to God is a sign for you. Let her pasture on God´s earth and do not hurt her in any way test so torment should overtake you from near at hand." Still they mistreated her, so he said: "Enjoy yourselves in your homes for three days [more]! That is a promise which will never be repudiated." Once Our command came along, We saved Salih and those who believed along with him from the disgrace of that day through mercy from Ourself. Your Lord is the Strong, the Powerful. The Blast caught those who had been doing wrong, so one morning they lay cowering in the homes. It was just as if they had never prospered there. Had not Thamud disbelieved in their Lord? Was it not: "Away with Thamud!"? Our messengers came to Abraham with good news. They said: "Peace! "; he said: ´Peace! ", and immediately set about bringing in a roast calf. When he saw their hands did not reach out towards it, he felt uneasy with them and started to be afraid of them. They said: "Do not act afraid; we have been sent to Lot´s folk." His wife was standing by and she laughed, so We informed her about Isaac, and following Isaac, Jacob. She said: "It´s too bad for me! Shall I bear a child while I am an old woman and this husband of mine is elderly? That would be an amazing thing!" They said: "Do you marvel at God´s command? God´s mercy and blessings are on all you people in [this] house. He is Praiseworthy, Glorious!" Abraham was so lenient, worried, concerned. "Abraham, avoid this! It is merely that your Lord´s command has come, and torment which cannot be averted has been brought them." When Our messengers came to Lot, he was uneasy concerning them and felt helpless about warding off anything they might do, He said: "This is a critical day!" His people came hurrying up to him; while just before they had been performing such evil deeds! He said: "My people, these are my daughters; they are purer for you. Heed God and do not shame me through my guests. Is there not a normal man among you?" They said: "You know we have no right to your daughters. You know what we want!" He said: "If only I had some power over you or could seek safety at some firm support!" stamped by your Lord. They never lie far from wrongdoers! To Midian [God sent] their brother Shuayb. He said: "My people, worship God [Alone]! You have no other deity except Him. Do not give short measure and weight. I see you enjoy well-being while I fear the torment of an overpowering day for you. My people, give full measure and weight with all fairness, and do not cheat men of their belongings nor cause havoc on earth as mischief makers do. Anything God leaves over is best for you provided you believe. I am no guardian set up over you." They said: "Shuayb, does your prayer command you that we must abandon what our forefathers worshipped, or that we should [not] do what we wish to with our property? Yet you are such a lenient, normal person!" He said: "My people, have you considered whether I bear any explanation from my Lord? He has provided me with handsome sustenance from Himself. I do not want to oppose you in what I am forbidding you; I only want to improve matters so far as I can manage to. My success lies only with God; on Him have I relied and to Him do I refer. My people, let not disagreement with me involve you in any crime, so the same fate as struck Noah´s folk, or Hud´s folk or Salih´s folk, will strike you. Lot´s folk even lived not far away from you. Seek forgiveness from your Lord; then turn towards Him; my Lord is Merciful, Affectionate." They said; "Shuayb, we do not understand most of what you say. We do see you are weak compared to us, and were it not for your immediate family, we´d expel you. You are not so dear to us." He said: "My folk, are my family ties dearer to you than God is? You thrust Him behind you, turning your backs on Him! Yet my Lord embraces anything you do. My people, do anything that lies within your power; I am (likewise) acting. You will soon know who will be brought torment which will disgrace him, and who is lying. Watch out! I am watching along with you." just as if they had never prospered there. Was it not away with Midian, just as Thamud was also sent away? to Pharaoh and his notables; so they followed Pharaoh´s command, even though what Pharaoh commanded was not sensible. He will appear before his folk on Resurrection Day and lead them on to the Fire. How awful will be (their) arrival wherever they are led! They will be followed by a curse in this [world] and on Resurrection Day; how awful is the gift which will be presented [them]! That is some of the news from towns We are telling you about; some of them are still standing there while [others have been] mown down. We did no wrong to ´ them but they had (already) wronged themselves; their (false) gods which they had been appealing to instead of to God [Alone] did not benefit them in any way once your Lord´s command came along, and they increased them in nothing except destruction. Even so will your Lord seize things when He takes over any towns while they are doing wrong; His seizing will be painful, severe. In that lies a sign for anyone who fears torment in the Hereafter; that will be a day on which mankind will be gathered, and such is a day when (every)one should be present. We will not postpone it except till a deadline which shall be counted out. The day it comes, no soul will speak up except with His permission. Some of them will feel miserable while [others] will be happy. remaining there so long as Heaven and Earth will last, except for whatever your Lord may wish. Your Lord is a Doer of whatever He wants! Those who have found happiness will be in the Garden, living there so long as Heaven and Earth may endure, except for whatever your Lord may wish, as a gift that will never crumble away. Do not be in any quandary about what those [people] serve; they only worship as their forefathers worshipped previously. We will repay them their share without omitting anything. We gave Moses the Book, yet disagreement arose concerning it. Had it not been for a statement which had previously gone forth from your Lord, it would have been decided among them. They are in such suspicious doubt about it! Your Lord will repay everyone for their actions, for He is Informed about whatever they are doing. Carry on just as you have been ordered to, as well as anyone who repents along with you. Do not act arrogantly: He is Observant of anything you do! Do not lean on those who do wrong lest the Fire should touch you. You have no patrons besides God; otherwise you will not be supported. Keep up prayer at both ends of the day; and at the approach of night. Good deeds remove evil deeds: that is a Reminder for such persons as will be reminded. Act patiently; God does not let the wages of those who act kindly be wasted. If there had only been a few persons with a little [sense] left to forbid corruption on earth out of those We saved among the generations before you! They followed those who did wrong in whatever they had been luxuriating in, and were criminals. Your Lord would never destroy any towns for doing wrong while their people were trying to reform. except for those to whom your Lord has shown mercy. For that reason did He create them, and your Lord´s word was completed: "I shall fill Hell with sprites and mankind all together!" Everything We relate to you concerning the history of messengers is what We brace your vitals with; through this, Truth comes to you, as well as a lesson and Reminder for believers. Tell those who do not believe: "Do whatever lies within your capacity; we are [likewise] acting. Wait! We are waiting (too)." God holds the Unseen in Heaven and Earth, and unto Him does every matter return; so serve Him, and rely on Him. Your Lord is not unmindful of what you (all) are doing.